Welcome to all of my new visitors. I am glad you are all here! 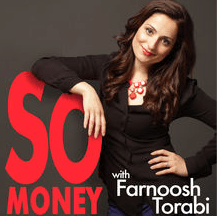 Please click here to check out the So Money Podcast with Farnoosh Torabi. I was honored to be a guest on the show and we had a conversation about me and the blog! She’s an awesome person and interviewer. Do something you’d do anyway! You can earn money while watching tv and surfing the internet thru Perk TV, Viggle and Swagbucks. Click here to sign up for Perk TV. You download the app and set it on auto-play to watch videos. I have a friend who has a graveyard of old smart phones. But they are all making money for him! He has the Perk TV app running on all of those old smart phones and tablets and is earning hundreds of dollars! Click here to sign up for Viggle. Click here to follow Viggle Boy! He has all of the insider info on making the maximum daily amount of rewards. Use Swagbucks to Vist your Favorite Sites. Don’t Oversearch – Swagbucks will only let you win about 3-4 times a day, and will very rarely let you win twice in the same hour. Sign Up Your Friends and Family. Use your swag bucks to Play Swagstakes for a chance to win big. Use Swagbucks TV mobile app to play videos and earn points passively. Task Rabbit is another place to earn money while grocery shopping or running errands for other people! You can even get paid to put together Ikea furniture! The possibilities are endless! On playing the interest rate game! When I bought my first car I had a 22% interest rate (ugh). If I had better credit, I could have qualified for a better interest rate and bought a car that would have been more reliable with a lower car payment! Welcome to the family! Stay tuned for more updates and followups on the things that were discussed with Farnoosh during (and after) the podcast! *Note some of the links are my personal affiliate links and we both may receive bonus points! Share your signup links with your friends!